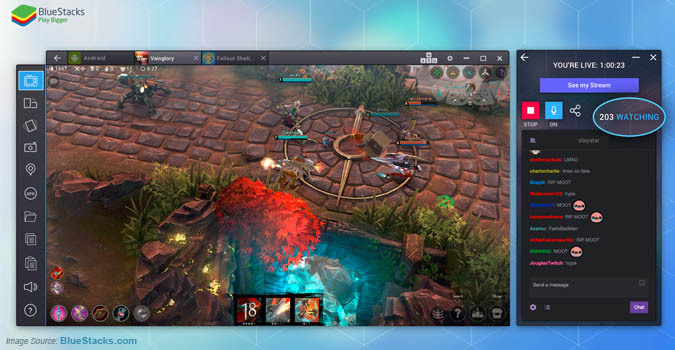 What is BlueStacks TV & How can I Stream With BlueStacks? What is BlueStacks TV? With BlueStacks TV one can stream the game which he is playing on BlueStacks to a huge community. BlueStacks integrated themselves with TWITCH and you just have to signUp OR Sign Into your Twitch account from App Player. After this, you can start streaming the Android game from your desktop. Moreover, one can also watch the live streaming of your favorite games from other peoples. One can watch streams and can play your favorite games at the same time. Moreover, setup your mic, webcam and preview the video before stream it live. With BlueStacks, one can simply grow his community by sharing the stream to other social media channels. Furthermore, it can let you be the biggest streamer of mobile games, with helpful tips and comments with Twitch Chat. To use BlueStacks TV you must have to meet certain requirements. Here we have a list of your PC requirements which must be met to move forward. You must be the administrator of the system. Your device must have at least 3GB DDR3 RAM. The disk space must be at least 4GB free to store the apps data. There should be Direct X 9.0 installed on your device. The graphics drivers for your PCs must be updated and aligned with the latest version. Your PC should have .NET framework 4.5 for windows 7 and above. Read more details about specifications FROM HERE. Now after this, you have to download the latest version of BlueStacks on your PC. When you start Streaming, you have a choice to either go with Facebook or with Twitch. 1. Find out how to Setup a Stream with Facebook Live. 2. Read about how to Setup a Stream with Twitch.